Months went by. I wanted the convention to happen already! I would check the website (http://www.imagecomicexpo.com/ ) every day. I would get more and more excited when they’d update the site with new exclusives! After months of preparing for the convention (in mind, body and soul), it was finally upon me! I was on my way to Oakland! I started to make reservations on the way. We were hoping to stay at the Oakland Marriot. It was supposedly less than ½ a mile from the convention center and the official hotel of the Convention. The convention rate was pretty good but the lady we talked to on the phone actually gave me another $20 off a night. I was not about to argue. The excitement was revving up! We finally arrived at the Oakland Marriott. While trying to find parking I realized something odd, yet AMAZING. The Image Expo was located in the convention center ATTACHED to the Marriott!! I almost blew a gasket!!! After circling the convention center/hotel, we finally parked the car. I had gotten to the point of almost being giddy. Upon arriving at the lobby, we were greeted by these two women. 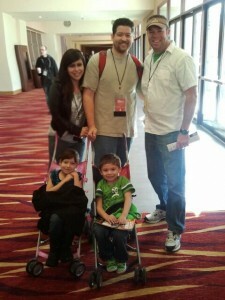 They checked me in early, as requested over the phone, and we were on our way to our room to drop everything else off. When we arrive at the room though, there was someone in it. It was one of the maids. I understood. It was pretty early compared to when most people checked in. So I just went back downstairs and let them know what was happening. They apologized for the inconvenience and immediately upgraded my room for free. I was floored. Never had I been met with such awesome service! Now I was on my way up to the 17th floor and I was even more excited now than I was before! These had to be great omens, right?! The view….wow. I had never heard anything good about Oakland before, but the view from my window was awe inspiring. It reminded me of the city-scape of Chicago. It looked so busy yet completely serene. I had a new respect for the city and its people then. I even went so far as to call my buddy Kevin (Brown), who is from Oakland, and apologized for ever saying anything bad about Oakland. Even on the way to the elevator, I had to take a look at the city. Beautiful. ON my way down from the elevator, I became uncontrollably excited and jittery. The excitement was, indeed, palpable. It could have been the breakfast I had earlier, but I am sure it was the excitement. We exited the doors and made our way down to through the hall. On my way I saw Richard Starkings (Elephantmen Creator/Writer and Comic Craft owner), Ryan Ottley (Invincible artist), Marc Silvestri (Witchblade and Darkness creator/artist) and Erik Larsen (Savage Dragon creator/artist). Another great omen. I went to the ticket line and picked up my badges. Even the people at the ticket booth were extremely nice. They handed me a bag that contained eight comics, to include the ultra-rare Image Expo Black and White ‘The Walking Dead” cover. This was the first time I met a man named John Huyler. This guy is one of the most awesome people ever. I will talk more about him later. After receiving our tickets, we got in the MVP line. Yes, we actually got to go in before everyone else! Ten minutes went by and the line was told “Image Expo is now open!”. I am pretty sure I blacked out and went into crazy geek mode because, before I knew it, I was standing in front of Ryan Ottley asking for a ‘Haunt’ commission. He told me the rate and I wanted a day to think about it. I could now calm down since I had talked to him about it. At this point I started walking around and getting a feel for the convention floor. The first thing I noticed was that I could see the end of the convention from the entrance. It wasn’t that big. Or rather, it wasn’t a lot of space. I state space because, at a few of the conventions I have been to, there is a lot of wasted space. Either there is nothing there or it’s just a bunch of tables. This was far better. Every space that was available had a purpose. The walkways were wide enough to where you wouldn’t have to bump into people as you walked. The lines for everything made sense and were conducted in a timely manner as well. But I digress. Now I had time to walk around and see all the things there were to see. Knowing that the “Founding Seven” signing was about to take place, I decided that we should get in line for that. We headed over to the line and got there in time to be one of the first 20 people ready to meet everyone. A few minutes later, the line was massive. Then the applause….they were on their way! My heart started racing. First was Marc Silvestri, Erik Larsen, Whilce Portacio, Jim Valentino and then Robert Kirkman. But Rob Liefeld and Todd McFarlane were nowhere to be seen. I have to admit. I was a little sad when I found out that both had been delayed by their planes. But there would be no reason to worry. They would eventually make it. Rob Liefeld showed up within 20 minutes of the time the signing was supposed to start and then it did. The line would commence without Todd McFarlane for the first day (SPOILER). We proceeded to walk through the line. Me with my son and my wife with my daughter. The first person up was Rob Liefeld. We said our pleasantries and he was a pretty nice guy. I asked if he could sign my sketchbook and he actually started drawing Badrock in it. I was surprised. I really didn’t expect a sketch at all! Then I pulled out my Official Image Expo guide and asked if he could sign that. He then sent it down the line. 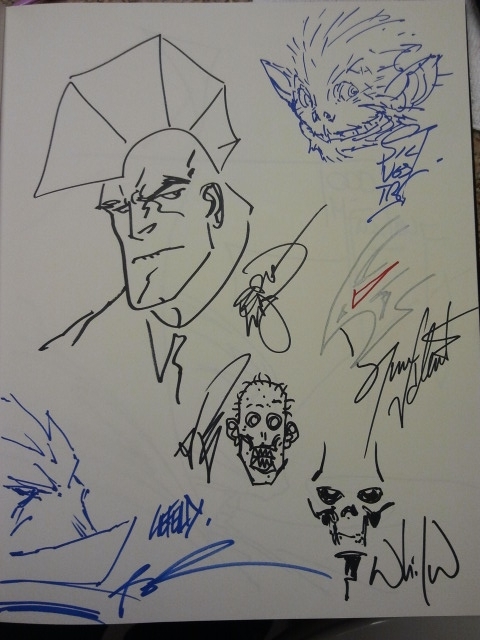 I then walked up to Marc Silvestri and asked if he could draw something in my Haunt sketchbook. He looked at me and asked for a reference picture. He laughed and called it “Dead Spawn”. I admit, I laughed too at that point. He went right to work though and actually drew a face of him in my sketchbook! I was excited! While looking at my new sketch, I walked over to Erik Larsen and just looked at him. He had just finished signing my guide and he passed it to Robert Kirkman. I thanked him and continued down the line. Really quick, Erik Larsen has always been one of those people I have always gone to see at the Image booth at other conventions. 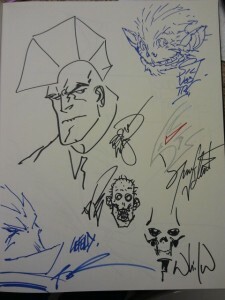 He always drew in my sketchbook and even drew me a Green Lantern Savage Dragon. He is super awesome. Back to Mr. Kirkman. Robert Kirkman signed my guide and “The Walking Dead” exclusive books I received for getting the MVP badge then asked to take a look at my ‘Haunt’ sketchbook. He liked it! I was surprised I was the only person that had apparently had this love for the character. He gave me my book back and I then headed over to Jim Valentino. I declared my love for the ‘Guardians of the Galaxy’ at that point. I asked if he liked the way they brought them back, but he didn’t seem to care. “They own the characters.” was his reply. I was a little saddened. He did such a good job on that book. I wish they had brought him back for ‘Annihilation’. Anyways. Then I was in line for Whilce Portacio. He had been the most quite of the group. Not saying much at all. I was kind of thrown back by that and totally forgot about getting my ‘Spawn’ 186 signed by him because of it. He gave me my guide back and then I turned to look at my wife and daughter. They were still at Marc Silvestri! I didn’t know what happened since it had taken me about three minutes to get through. I walked up to her to see that everyone was sketching on a single page in her sketchbook. Marc Silvestri drew a Darkling, Erik Larsen drew Savage Dragon, Rob Liefeld drew Badrock, Robert Kirkman did his best to draw a zombie, Jim Valentino drew Shadowhawk and Whilce Portacio drew a character from Wetworks. We hadn’t even been there for an hour yet and my wife came out with this awesome piece of art! I was still in awe when we hit the corner and saw the Man of Action booth. As soon as I looked up I saw Steven Seagle. I had met him years earlier with the rest of the group and he looked the same. He still had that same smile and good attitude from back then. We talked for a little about the many things Ben 10 and Generator Rex and we ended up walking away with a Ben 10 Alien Force paddle ball, two roll-up Omnitrixs’ and a book he created called ‘Frankie Stein’, which is a very good kids book. From there we made our way back to the front of the convention. I wanted to go through and see everything one-by-one and my wife was all for it. We started by heading down the main entrance hall. That is where I got my first glimpse of Big Chris. Out the corner of my eye, I saw a Captain America and Red Skull painting. I raced to it. It was beautiful. I am not a HUGE Captain America fan, even though I thought the movie was awesome, but this was a definite piece of art. Me and my family walked over and started looking around. He has a definite passion for things that are horror. The artwork he had was great and the prints he had were amazing as well. We talked to him and his wife for a while and finally got the courage to ask him to sketch a couple of ‘Skylander’ characters for my kids. Yes. They have their own sketchbook as well! He said it would take a few minutes, so we decided to go perusing through Artist Alley. Artist Alley turned out to be a lot more fun than other conventions too. I’m not sure if it was because we actually walked through and looked at everything, or if it was because we had the kids, but it was very cool. Sterling Clark was there and he was extremely nice as well. I found myself talking to him for about ten minutes about both our times in the military. He is a very interesting man. In that time I promised I would buy something on Sunday because I was very impressed with is art. Then we continued our journey through Artist Alley. Many treasures were found there. I wish I could remember everyone’s name but that is the problem with having such a bad memory. I saw things that I can now remember and I wish I would’ve bought that day. Maybe I will have better luck at Wonder Con. About 20 minutes had passed at this point, so we decided to head back to Big Chris’ booth. He saw us walking up and had a huge smile on his face. He turned the book around to show us the sketches. They came out BEAUTIFULLY! I was extremely excited for my kids at that point. And they LOVED them! They wanted to hold the pages and not even share! I was very impressed with his art and I will soon buy one of his pieces. That is certain. While walking through the main exhibitor hallway, we happened upon the Image booth. This thing was MASSIVE. It almost hit the ceiling and had almost all of Image’s current books (hardcovers and paperbacks) with the exception of a few. They had tons of merchandise though. The only thing we couldn’t find, which my wife wanted more than anything, was an official Image Expo shirt. Even I was dumbfounded as to why they didn’t have some kind of shirt. She settled and bought a ‘Walking Dead’ shirt though. She was happy with that. Straight from the Image booth, we headed towards the McFarlane Studios booth. He had EVERYTHING there. Statues, toys and comics from every line, including things that were not even out yet were displayed at this booth. I had to get something and I eyed the Spawn Beginning statue. It was $100 and came with a ticket to get it signed by Todd McFarlane, first print of issues 1 and 2 of Spawn, issue 215 of Spawn signed and issue 217 which wasn’t even out yet! The hook was that you could get all of it signed at a signing designated for this particular statue only. It would weigh on my mind that night. Shortly after, we went up to the room. We had stayed all the way up until 30 minutes before closing. Where had the time gone!! It was time to go to sleep and I had a ton on my mind. *My wife. I love her. She comes with me to all of the conventions and makes sure I have the best time at every one of them. Without her and my kids, I do not know (nor do I want to know) where I would be. I met Marc Silvestri at the ’01 SDCC. One of the freakin nicest guys there! It was preview night I was going around asking writers & artists for their picture and he comes walking by with the Top Cow model. I say can I get a pic with you and the lady. Well he says “No! I’ll take your picture with her!” He grabbed my camera, I stood behind her holding her bikini straps, took the picture & then I got his! Shook his hand & away he went. Only regret? I was so shocked by it all, I forgot to say how I LOVED his X-Men stuff. I was the same way! So shocked I forgot to get my Witchblade signed! I will go into further explanation in Day 2! !